Contech Conservatories was recently contracted to supply all windows, doors and bifold doors for a renovation project near Stoke-on-Trent. The extension of a premium home by Contech customer, Concadia Ltd, required the best in performance, style and security to meet homeowners requirements. The luxury private home has a traditional character so the extension needed to complement the existing property style, whilst ensuring the house could achieve excellent performance ratings throughout. 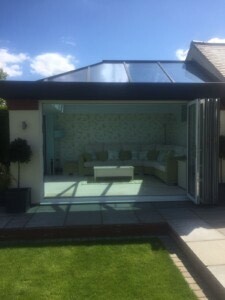 All products were supplied by Contech Conservatories. Mark Platt is a longstanding customer and has used Contech Conservatories since the company was launched, knowing that lasting guarantees will substantiate the services he offers. Mark’s company relies upon referral business and has developed a strong reputation as a reliable business for renovation and new build projects in and around the Staffordshire area. For the Contech Conservatory team, providing customers with the reassurance of industry accreditation ensures that price is not the only consideration when discussing benefits with homeowners.